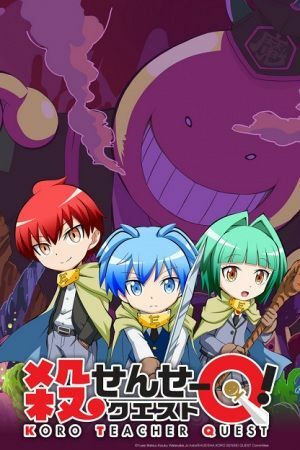 One day, class 3-E of Kunugigaoka Magic School receives a special mission: to kill their homeroom teacher, the Demon King Koro-sensei. To increase their chances of succeeding, the class searches for the three most powerful warriors—Karma Akabane, Itona Horibe, and Ritsu—who later join their company. Even with their help, accomplishing the mission becomes an insurmountable task as they are not the only ones after the Demon King's life. Koro-sensei Quest! tells the comedic adventures of Nagisa Shiota and class 3-E as chibi magical students. Trained by none other than their very target, the students encounter challenging, yet hilarious situations all through the perilous mission of defeating the Demon King.